PART NUMBER UNIPART GSA 50297. ASTRA G Saloon 1.7 DTI 16V (1998 to 2009 ). LOCATION TOP 3. 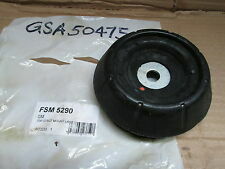 PART NUMBER UNIPART GSA 50304. CITROEN C3 XTR 1.6. LOCATION TOP 3. Model year from: 02.99, Model year to: 09.01, Fitting Position: Front Axle,Fitting Position: Right. Fitting Position: Front Axle, Engine Code: D7F 720. Fitting Position: Front Axle. Fitting Position: Front Axle, Engine Code: K9K700, Engine Code: K9K702. PART NUMBER UNIPART GSA 50303. MG MG ZT 190 2497 140 6 Saloon 2001-2014. MG MG ZT 160 2497 118 6 Saloon 2001-2014. MG MG ZT- T 160 2497 118 6 Estate 2001-2014. MG MG ZT- T 190 2497 140 6 Estate 2001-2014. 10.05 - 11.11. 03.98 - 04.04. 09.04 - 02.12. 10.01 - 11.11. 09.01 - 10.04. 01.04 - 11.11. 04.04 - 08.06. 08.98 - 08.06. PART NUMBER UNIPART GSV 2113. FORD FIESTA Mk IV (JA_, JB_) 1.0 i. FORD FIESTA Mk IV (JA_, JB_) 1.25 i 16V. FORD FIESTA Mk IV (JA_, JB_) 1.3 i. FORD FIESTA Mk IV (JA_, JB_) 1.4 i 16V. FORD PUMA (EC_) ST 160. 03.01 - 10.05. 03.02 - 10.05. LOCATION MIXED 1. 03.03 - 10.05. 03.00 - 08.05. 09.00 - 08.05. 09.02 - 08.05. 03.98 - 04.04. 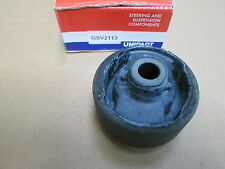 PART NUMBER UNIPART GSV 2465. Fitting Position: Rear Axle. SEAT TOLEDO (1L) 2.0 i 16V. THIS ITEM WILL FIT THE FOLLOWING MODELS. 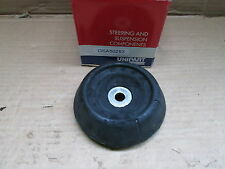 PART NUMBER UNIPART GSA 50302. VW POLO DERBY IBIZA & FABIA FRONT STRUT TOP MOUNTING. SKODA FABIA 1.4 1397 50 4 Hatchback 1999-2008. SKODA FABIA 1.9 SDI 1896 47 4 Hatchback 1999-2008. SKODA FABIA 1.0 996 37 4 Hatchback 1999-2002. PART NUMBER UNIPART GSV 2115. FIAT PUNTO FRONT LEFT OR RIGHT HAND MOUNTIN AXLE BRACKET BUSH. FIAT PUNTO (176_) 55 1.1. FIAT PUNTO (176_) 60 1.2. FIAT PUNTO (176_) 75 1.2. FIAT PUNTO (176_) 1.2 16V. FIAT PUNTO (176_) 1.4 GT Turbo. 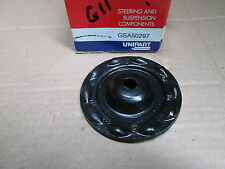 PART NUMBER UNIPART GSV 2109. PEUGEOT 406 (8B) 1.6. PEUGEOT 406 (8B) 1.8 16V. PEUGEOT 406 (8B) 1.8. PEUGEOT 406 (8B) 2.0 16V. PEUGEOT 406 (8B) 2.0 Turbo. PEUGEOT 406 (8B) 2.0 HDI 110. PEUGEOT 406 Estate (8E/F) 2.0 HDi 110. RENAULT CLIO Mk II (BB0/1/2_, CB0/1/2_) 1.2 (BB0A, BB0F, BB10, BB1K, BB28, BB2D, BB2H, CB0A.) 98'-∞' D7F 720 43 Kv / 58 PM 1149Sm. RENAULT CLIO Mk II (BB0/1/2_, CB0/1/2_) 1.2 (BB0A, BB0F, BB10, BB1K, BB28, BB2D, BB2H, CB0A.) 98'-∞' D7F 726 43 Kv / 58 PM 1149Sm. Boxed Unipart GSV2771. 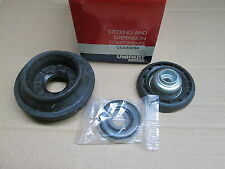 Unipart Steering & Suspension Components. RENAULT LAGUNA II (BG0/1_) 1.6 16V (BG1G, BG1H). RENAULT LAGUNA II (BG0/1_) 1.8 16V (BG06, BG0J, BG0M). RENAULT LAGUNA II (BG0/1_) 1.8 16V (BG04, BG0B, BG0C, BG0V). RENAULT LAGUNA II (BG0/1_) 1.8 16V (BG0B, BG0M). Boxed Unipart GSV3038K. Unipart Steering & Suspension Components. VAUXHALL ASTRA Mk IV (G) Estate 1.7 TD. VAUXHALL ASTRA Mk IV (G) Estate 2.0 DI. VAUXHALL ASTRA Mk IV (G) Estate 2.0 DTI 16V. VAUXHALL ASTRA Mk IV (G) Coupe (F67) 1.8 16V. VAUXHALL ASTRAVAN Mk IV (G) 1.6 i. PART NUMBER UNIPART GSV 2643. BMW X5 (E53) 3.0 i. BMW X5 (E53) 4.4 i. BMW X5 (E53) 4.6 is. BMW X5 (E53) 4.8 is. Fitting Position: Rear Axle, Fitting Position: Left, Fitting Position: Right. 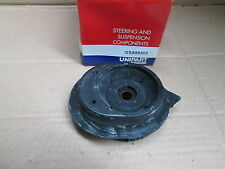 BMW X5 (E53) 3.0 d.
PART NUMBER UNIPART GSV 2734. LOCATION UNIPART 2 & 3& 4. RENAULT CLIO THALIA & TWINGO REAR LEFT OR RIGHT HAND AXLE MOUNTING BEAM BUSH. RENAULT CLIO Mk II (BB0/1/2_, CB0/1/2_) 1.2 (BB0A, BB0F, BB10, BB1K, BB28, BB2D, BB2H, CB0A.). 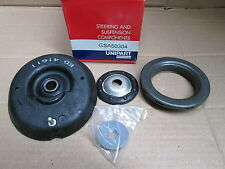 PART NUMBER UNIPART GSV 4537. LOCATION UNIPART 2. BMW REAR LEFT OR RIGHT HAND MOUNTING AXLE BRACKET BUSH. Fitting Position: Rear Axle, Fitting Position: Left, Fitting Position: Right. BMW 3 (E30) 315. The part is marketed by Unipart and their reference number is GSA50297. A new strut top mounting plate for Vauxhall Astra G models from 1998 to 2004. UNIPART MERCEDES SPRINTER VW LT AINT ROLL BAR BUSH x2 GSV2672K FREE P&P! MAKE: UNIPART. you get two boxes one in each. PART NUMBER : GSV 2672. We understand that circumstances can change., We will then check the item/s for faults. need to be sent back to us. Parts that are new used have never been fitted to a car. Unipart GSV2771. Fiat Punto 1.1i, 1.2i, 1.4i, 1.6i, 1.7D, 1.7TD 8/93 - 10/99.